We have callside (playside) and backside linemen. When breaking the huddle we want to get our offensive linemen to the line of scrimmage quickly, we want to run as many plays as possible, this is accomplished for us by huddling our offense four yards off the ball, which gets us to the LOS faster (control the clock, gain additional plays). Offensive line play and the way you decide which athlete plays where can vary depending upon preference and talents. As we decide which athlete plays where in the offensive line, we choose players by their special talents that they will bring to that position. As stated we will play with a right and left side, with the playside being called the callside and all players on the other side of the center being designated as backside players. The tight end will always follow the right and left call when breaking the huddle. A defense will usually set their strength call to the two-receiver side or tight end. Something we like to focus on early in the installation process is huddle demeanor. We will practice our offensive unit on how to take the field and consistently demand proper huddle alignment. The way you take the field and the way you huddle are the first things a defense see; don’t show any weakness here, you must make a statement. Don’t show a defense that you are tired, keep your eyes up, and the huddle organized and looking good. If you look tired or unorganized it might bring more life into the defense if they think they have you scrambling to catch your breath or get plays called in the huddle. So, show life in the way you take the field and the way you huddle up after each play, make a statement to the defense that they are in for a long game. The following criteria is used for choosing offensive players for their given position in our Spread Offense. Center: The quarterback of the offensive line should be intelligent and have the ability to work with both the callside and backside guards; they must understand ace ram and lion combinations. Also, the center must be able to make calls and recognize defensive fronts in order to set pass protection schemes. Right Guard: Should be your strongest offensive lineman. Your right guard will be put in more positions to have to single block defensive tackles than any other lineman that you have in the gun option offense. Right Tackle: One of our bigger linemen but not one of your strongest. With the design of our blocking schemes and the gun option offense, you will find the right tackle is usually getting help from either his tight end or right guard. The combo’s deuce and trey will allow you to put one of your slower footed linemen at this position because the tackle is always getting some sort of help. Left Guard: One of your smaller linemen can play this position. Your left guard is usually getting help from his center and left tackle. They must learn the ace and deuce combination blocks, seldom is he put in a position to have to single block any down defender. Left Tackle: Best-footed lineman should play this position because of the passing game, this is where most defenses usually put their faster defensive end; the tackle must be able to protect quarterbacks backside. The left tackle needs to have good feet for wide rushers coming off the edge in the passing game. Also, they need to know the trey and deuce combination schemes. Receivers: A fearless athlete that will compete on every play, whether it’s working to get open or blocking until the whistle. A player that understands a commitment to teamwork, willing to block or run their assigned routes and give 150% effort on every snap. Running Backs: This offense is adaptable to a variety of talents. Don’t get caught up into thinking that you must have a big, strong fullback. The most important quality is competitiveness. Because the gun option offense can be run from a two back set, the ideal situation is to have two backs with the same qualities this will eliminate some tendencies that this offense may give. Remember, this for simplicity, the back that aligns towards the callside in the two back set will be known as the fullback or 3 back and the back aligning away from the callside will be your tailback or 4 back. Quarterback: The position requires a player that is willing to work and learn, regardless of the amount of time, to execute the offense to perfection. A competitor that has the respect of his teammates, whether through work ethic, talent or personality, that understands the quarterback position is one of eleven needed to perform at the highest levels. The alignment by the backs can change according to the play called or by athletic abilities. In the Gun Offense whether it be one or two backsets, the backs along with the quarterback will align their heels at 5 yards off the ball. The “Z” receiver is also designated as the number 2 back when in the “stacked I”. The first digit in the play called will tell you who gets the ball and the second digit will tell you the location of where you want the ball to go. 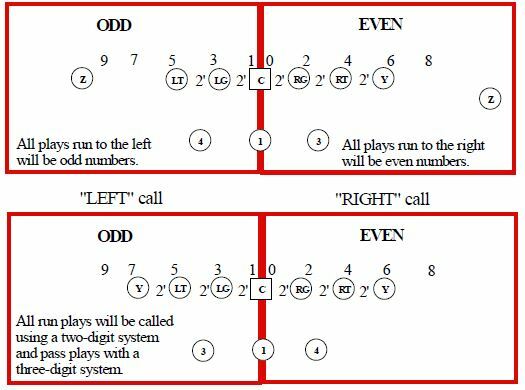 The “EVEN” numbered plays are run to the right side, and all “ODD” numbered plays run to the left side. 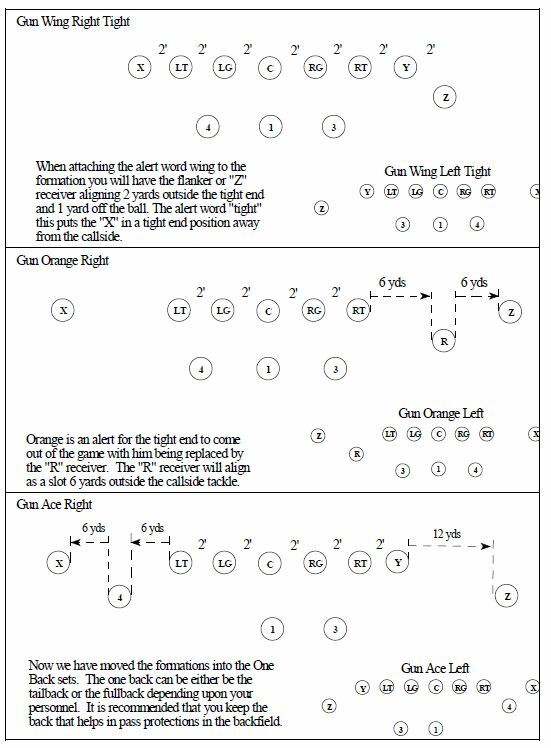 The designation of “RIGHT” and “LEFT” is to identify the formation and to set pass protections. Also, the right and left call tells the tight end also which side to align to. 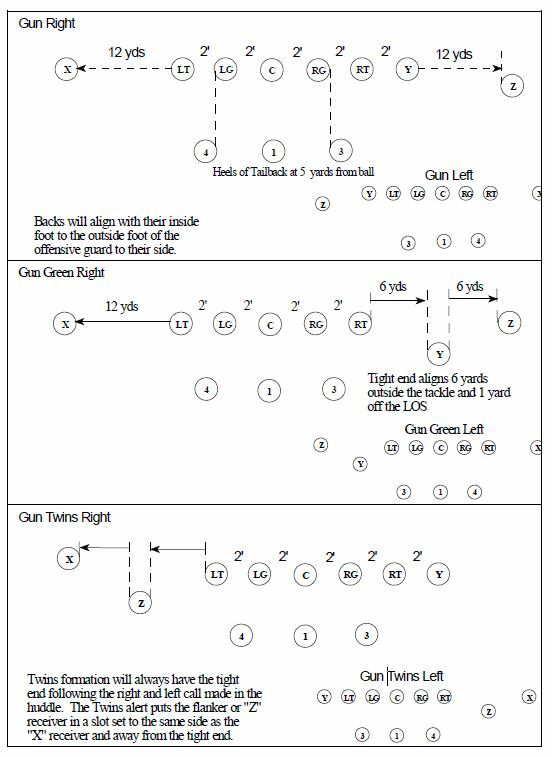 Note: plays called outside of the tight end will be numbered “9” to the left, and “8’ to the right. 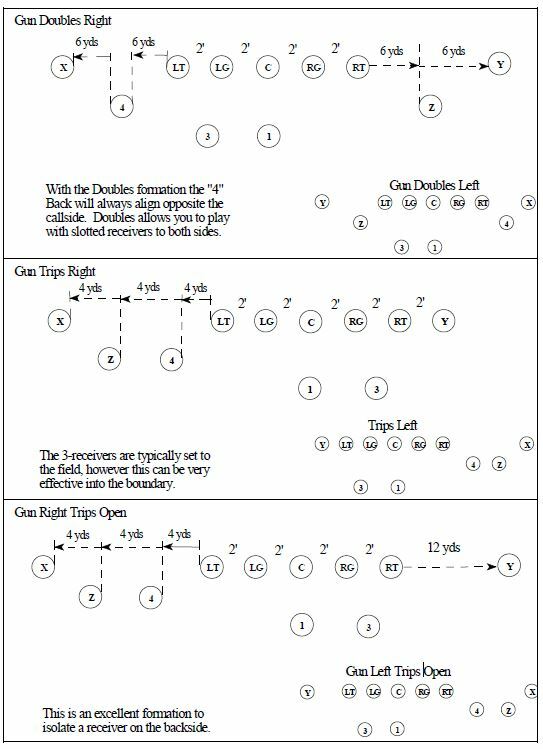 Strength of formation, placement of the Tight End, Backs, and Wide Receiver’s, has no effect on the hole numbering system. They will always remain constant; i.e., even holes to the right, odd holes to the left. This section presents many different offensive formations and the way you might want to name or call each one. Many coaches have their own names for formations that they use but we have tried to standardize each formation to the types of names that we use and that most coaches around the country use. Because there are so many variations in the types of plays that can be called, use your imagination and try to apply each play that you read to the different formations and backfield sets in this manual. See if the play fits your formation and backfield set philosophy. 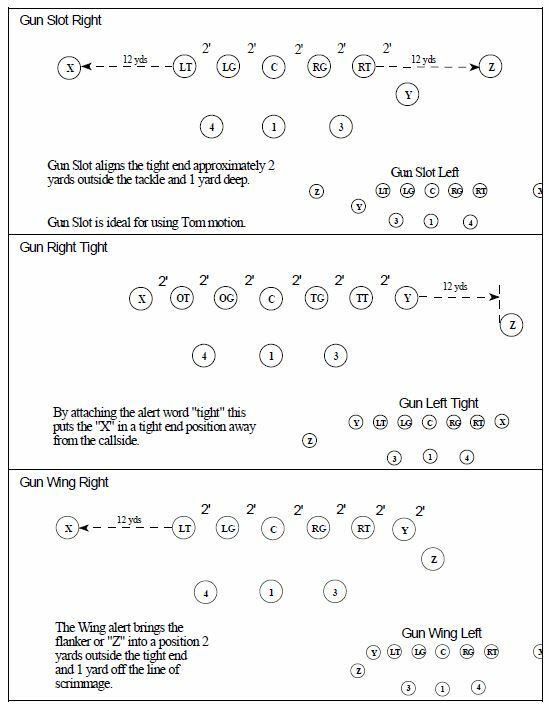 All formations will set to a “Right” or “Left” call made in the huddle. The right and left call sets the offensive formation and alerts the tight end to which side to line up on.